It’s hard to argue with the old saying that breakfast is the greatest meal of the day. Start with a proper feast and you really are set up for the day ahead. 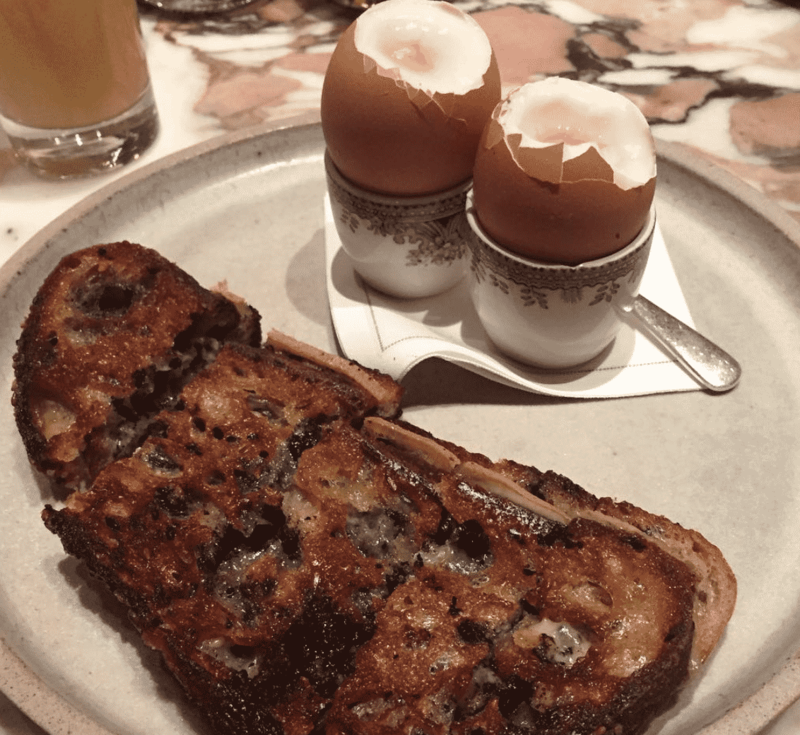 London breakfasts come in all shapes and sizes from quick bites you wolf down jumping on the tube, to high end 5-star hotel buffets. 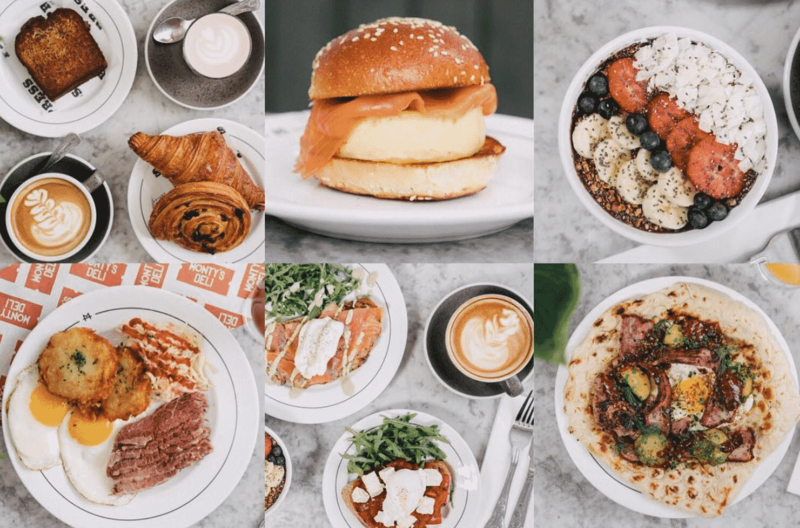 We thought it was about time we rounded up the very best of the best and gave you a London breakfast bucket list to work your way through. We’ve even thrown in a few weekend brunch items too, for those who prefer their breakfast around noon. 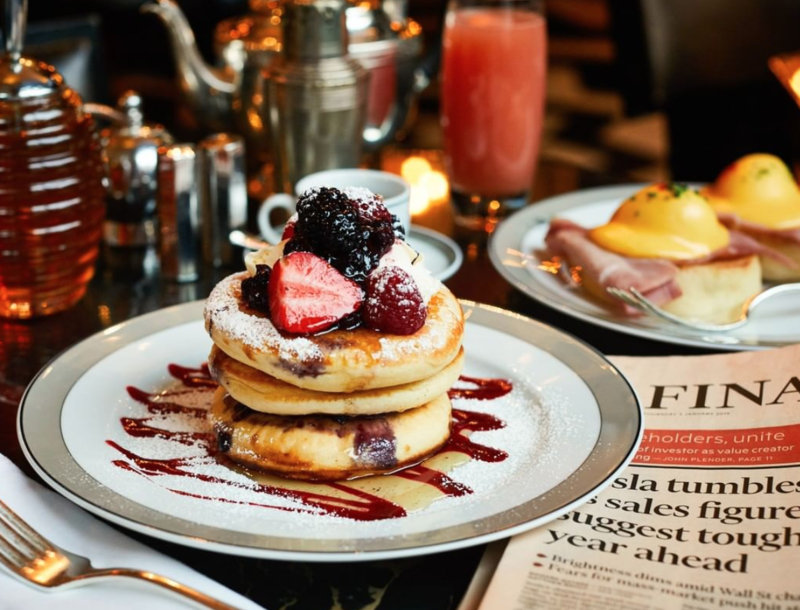 They start serving from 7am on weekdays in the heart of Mayfair. 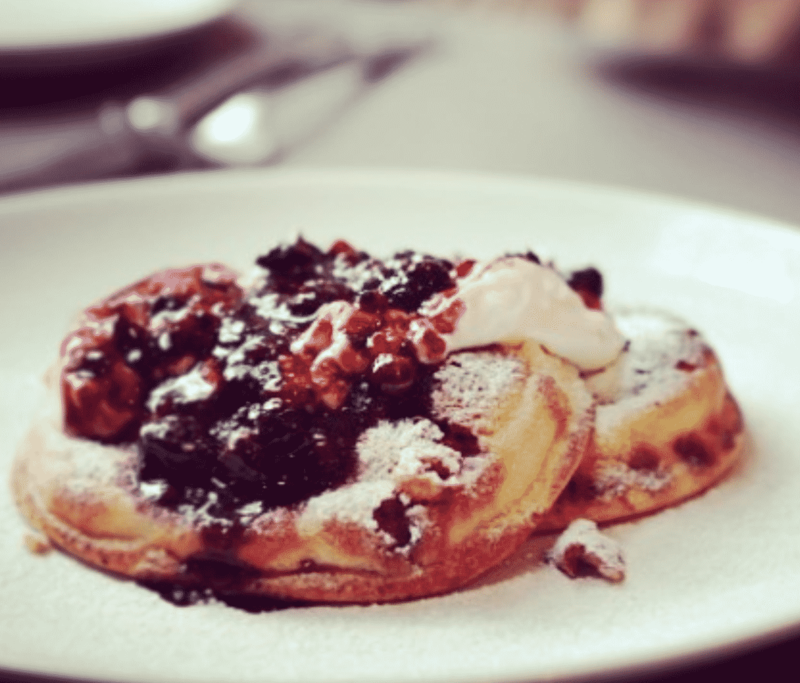 The pancakes are light, fluffy and the ultimate midweek treat. 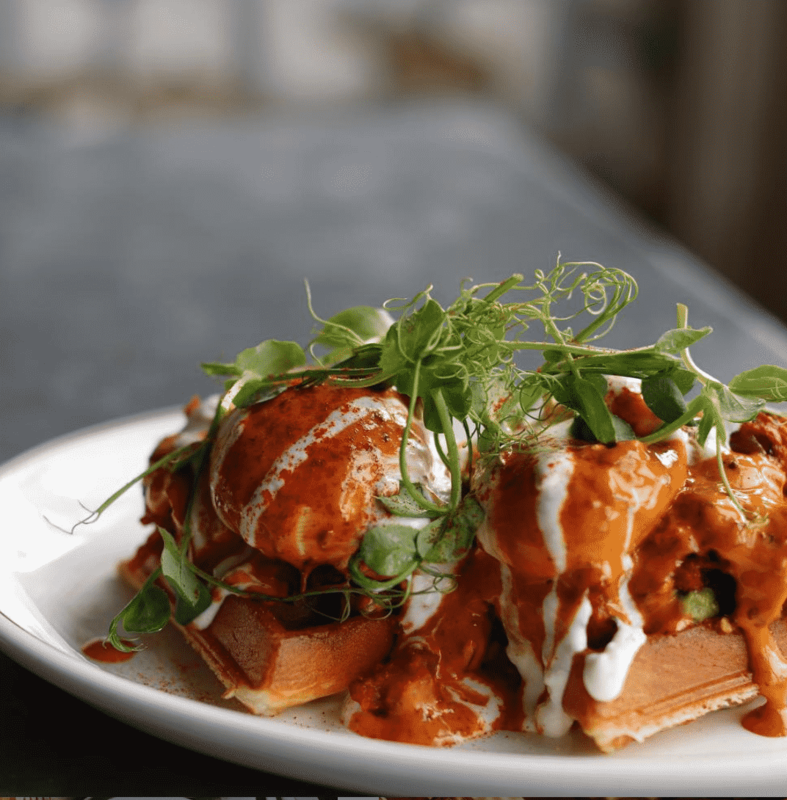 A simply incredible dish where they combine Butternut Shakshuka served on green chilli & cheddar waffles. The best of both worlds, with a wonderful kick to it. 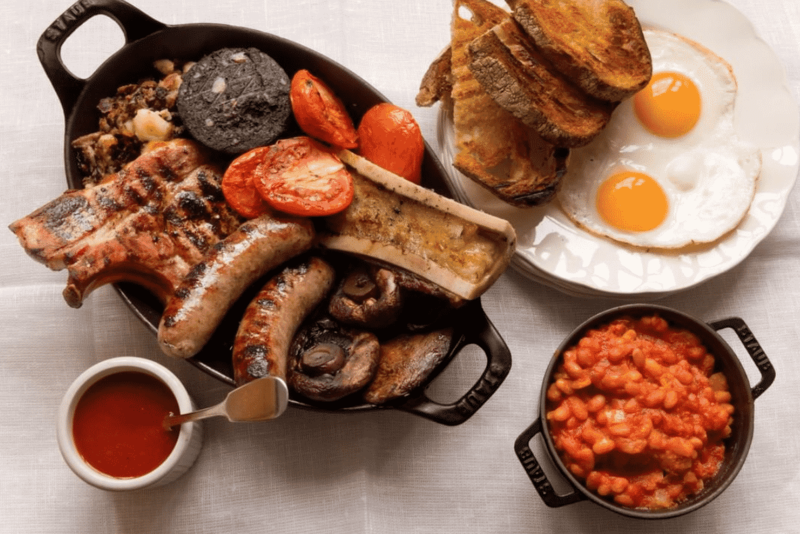 Hawksmoor is best known for their steaks and burgers, but this is one of the best full English breakfasts in the country. 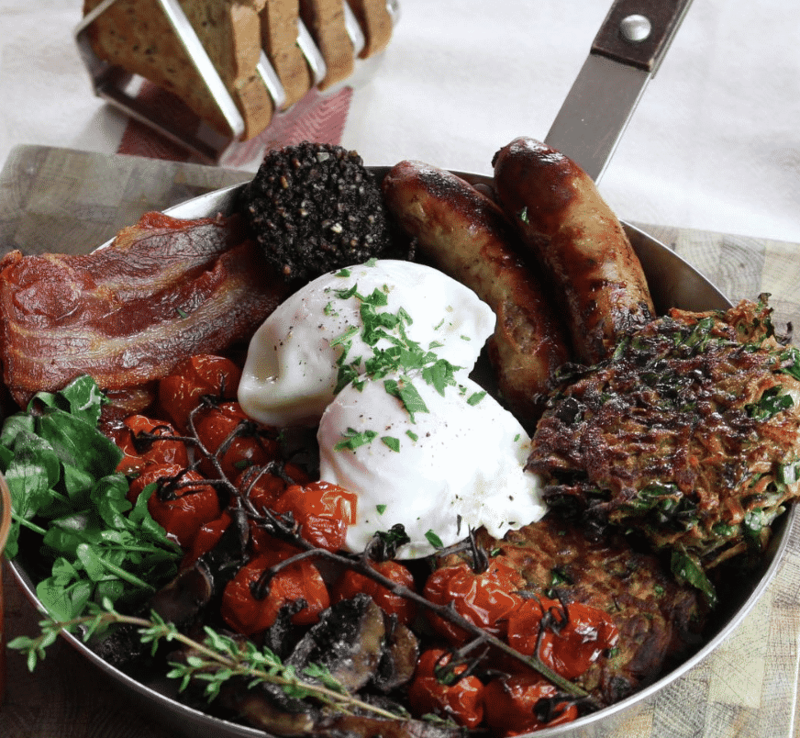 Plum Pudding bacon, sausage (made with pork, beef & mutton), black pudding, fried eggs, hash brown, grilled mushrooms, roast tomatoes, trotter baked beans and toast. A feast. 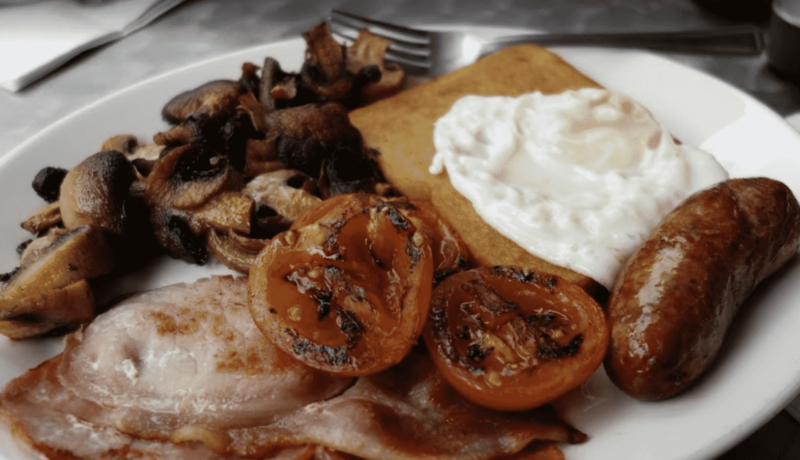 A wonderful breakfast menu that is packed full of healthy treats, but to miss out on this feast served up family style at the table would be a travesty. All of the deliciousness. They call it “The Gatherer” (as opposed to “The Hunter”) and it might very well be the best veggie breakfast in the whole city. You’d come every week for the fried Halloumi alone. 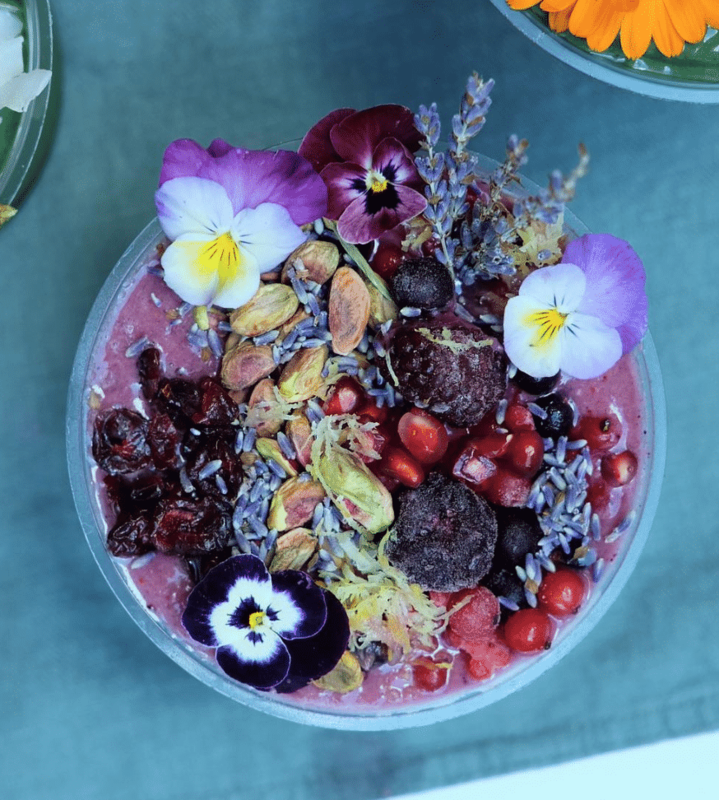 A bowl of pure health that contains blue matcha, berries, frozen pineapple & almond milk sprinkled with our seasonal toppings. It’s nearly too pretty to eat and is certainly worthy of your Instagram feed. 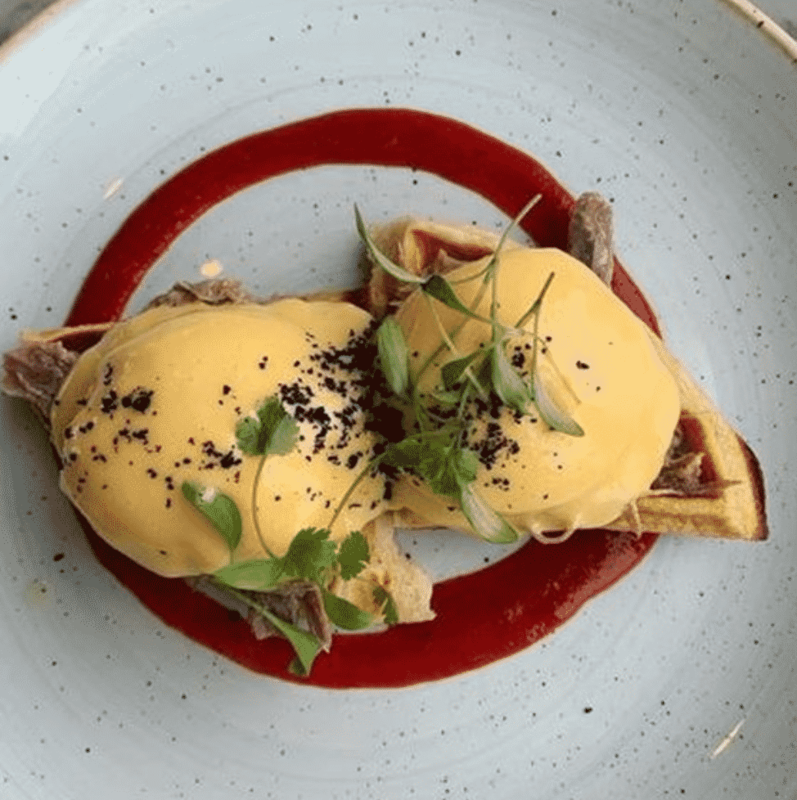 Granger and Co. has done so much to advance the Australian style brunch and coffee culture in the UK and this classic dish is the perfect example. 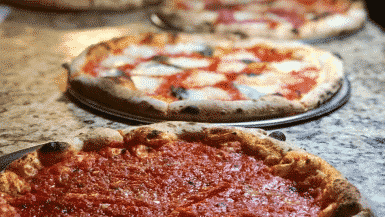 High quality ingredients cooked with skill and precision. This is an English Muffin topped with Smoked Salmon, Poached Egg and Beet Hollandaise. The food in here is so pretty that it nearly feels like art work. Absolutely delectable. 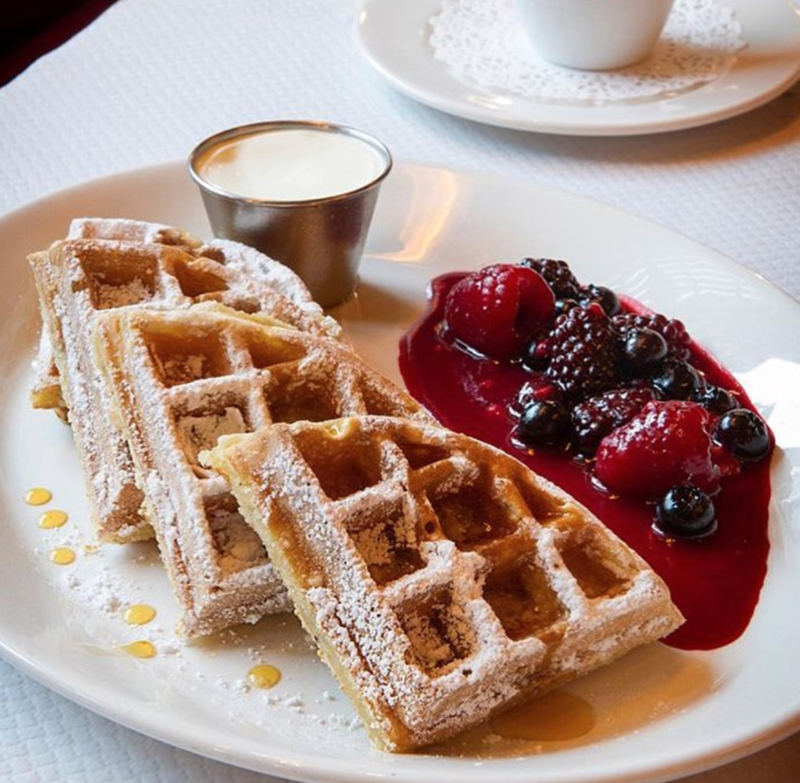 One of the great dishes on the London brunch scene and an extension of the famous Croque Madame. This “Croque Moo’dame” has doubled down on cheese and added beef. A delight of a dish. 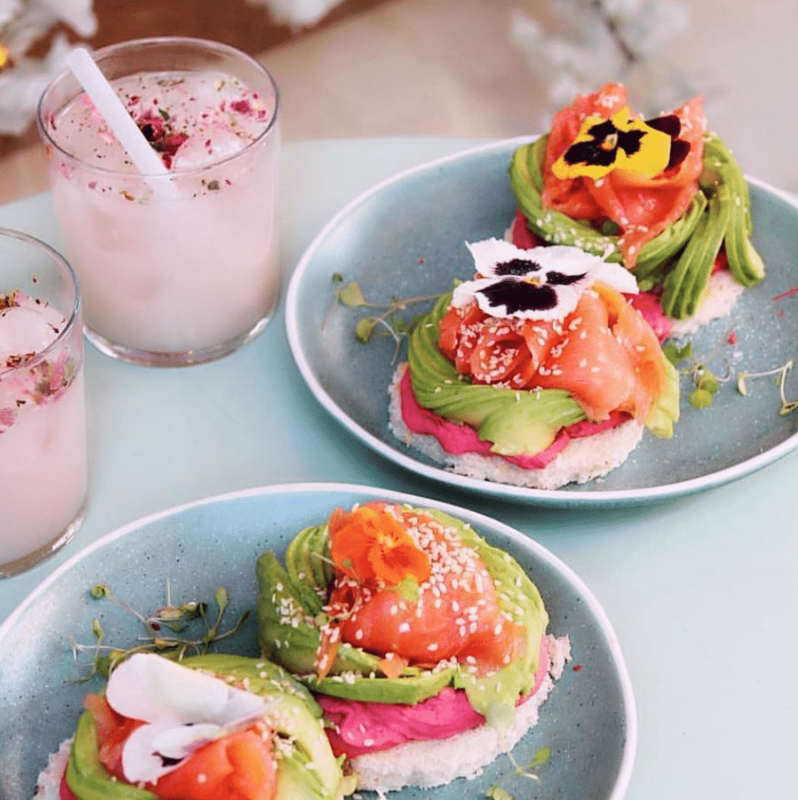 You probably know the Peruvian restaurant for their amazing fresh dishes including the ceviche, but their breakfast is an absolute humdinger as well. 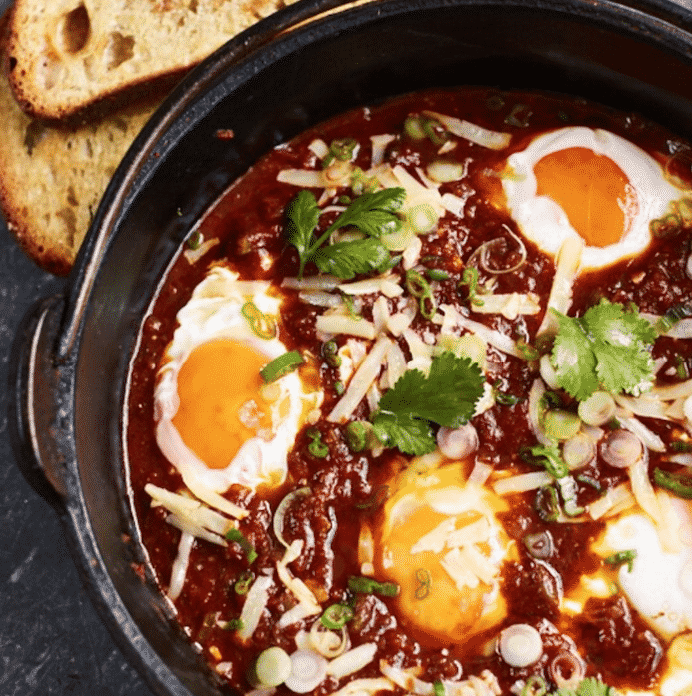 The chili eggs are perfect for dunking that sourdough into. When French Toast is cooked to perfection there’s nothing better, and perfect is what Local Hero does to a tee. Doorstep chunks of bread, fried and fluffy with all the trimmings. 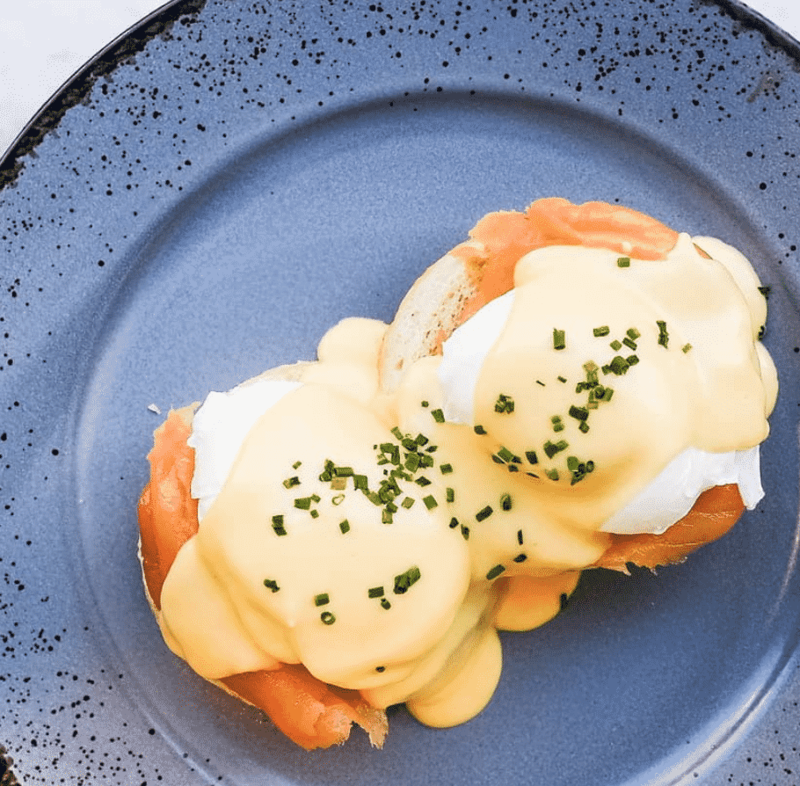 Choose from Foccacia or English muffin, with two organic eggs and Hollandaise sauce. A simple, classic dish, but the beauty here is that they execute it absolutely perfectly every single time. The sauce is lick-the-plate good. 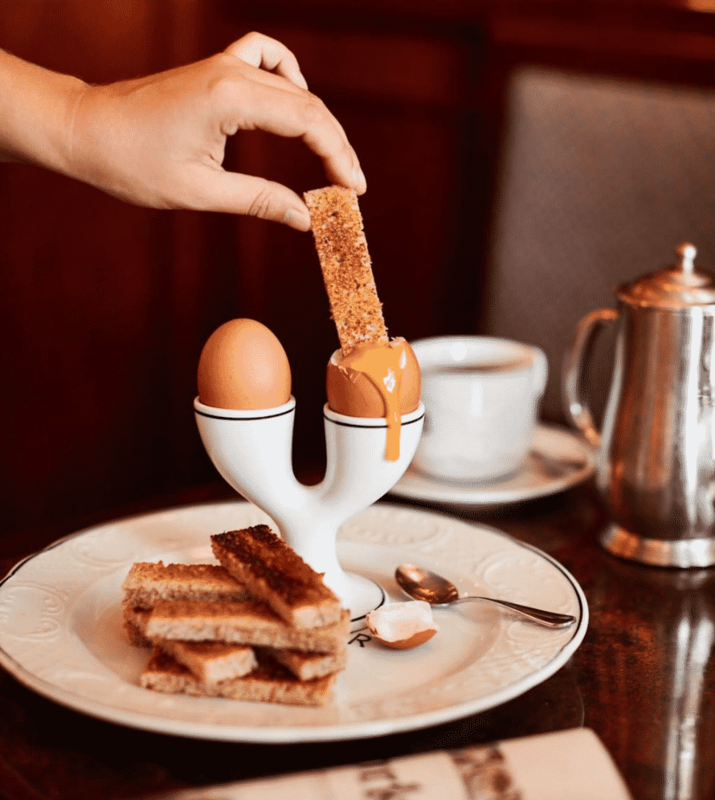 A traditional French brasserie isn’t the first place you’d think of heading in London for breakfast but once you see the perfection of their eggs with soldiers in terms of execution, taste and presentation you’ll be glad you made the choice. If somewhere has been open since 1900 you know they have to be doing something right. Their breakfast has been putting smiles on faces for decades and is exactly how you should start your day. 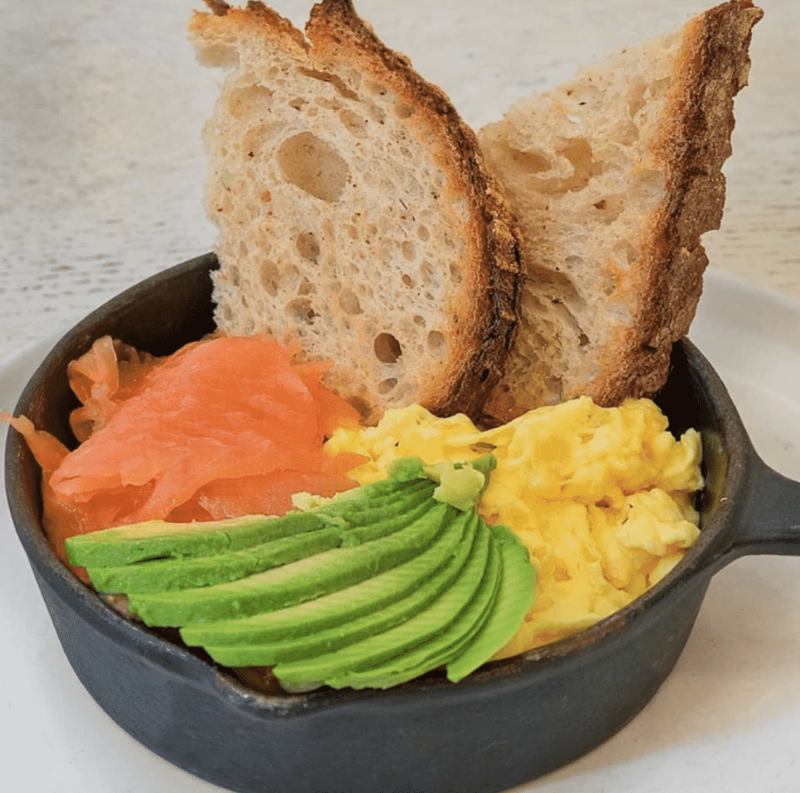 They serve their unique small sourdough breads with a series of different breakfasts fully cooked and baked into the bread. Wonderfully unique and a great way to start the day. 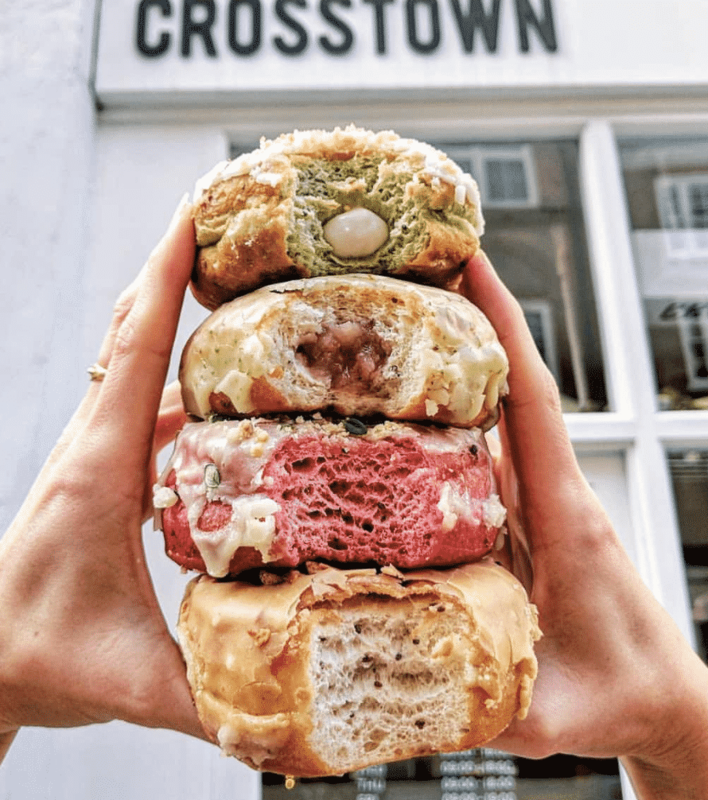 Can you consider a doughnut breakfast? Of course you bloody can! The only cheeky thing about it would be having a second one, which given how tasty they are is a near inevitability. Healthy food isn’t meant to taste this good is it? 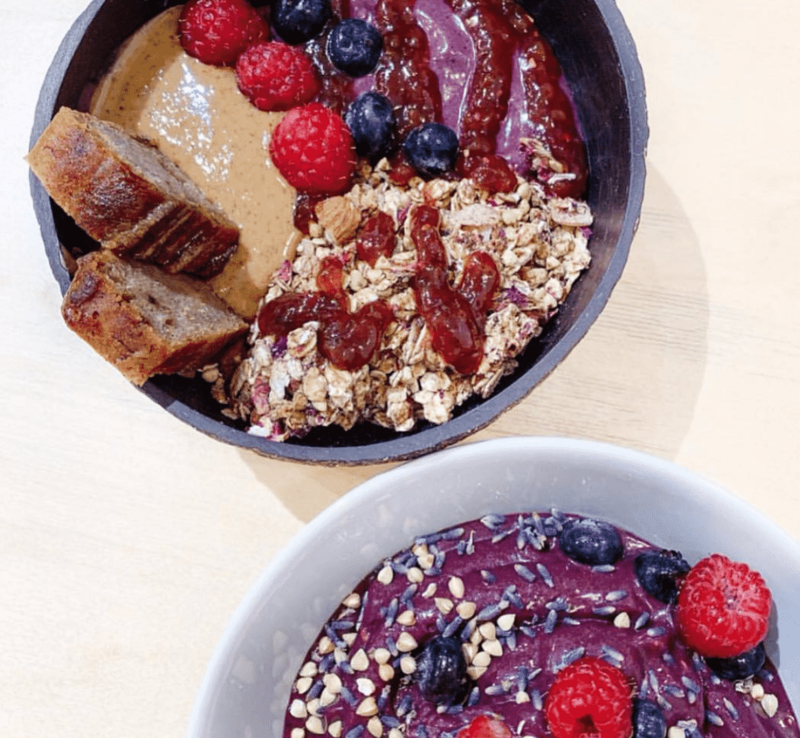 The PBJ Bowl: A base of açai, banana, mango, raspberry and peanut butter, topped with mixed berries, raw homemade berry chia jam, peanut butter, homemade raspberry and rose adaptogenic Beauty granola, and blueberry waffle or banana bread toast! You’ll be able to look out over the city with one of the best views going and do so while enjoying braised duck leg, buttermilk waffle, hen’s egg & Sriracha. The treat to end all treats. 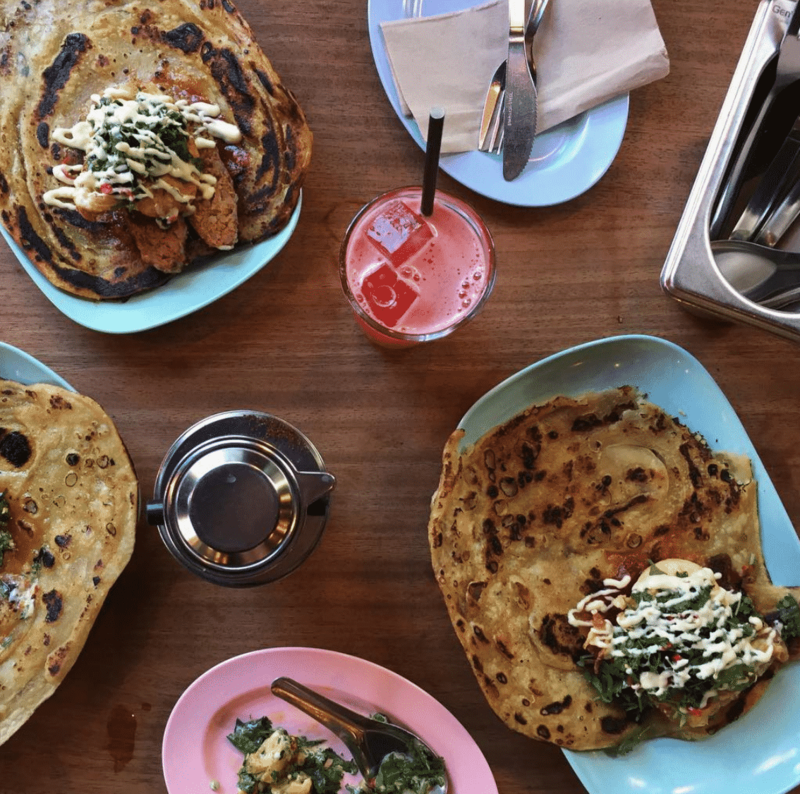 This Bombay styled Indian cafe has one of the “cleanest” fry ups you’ll ever taste. 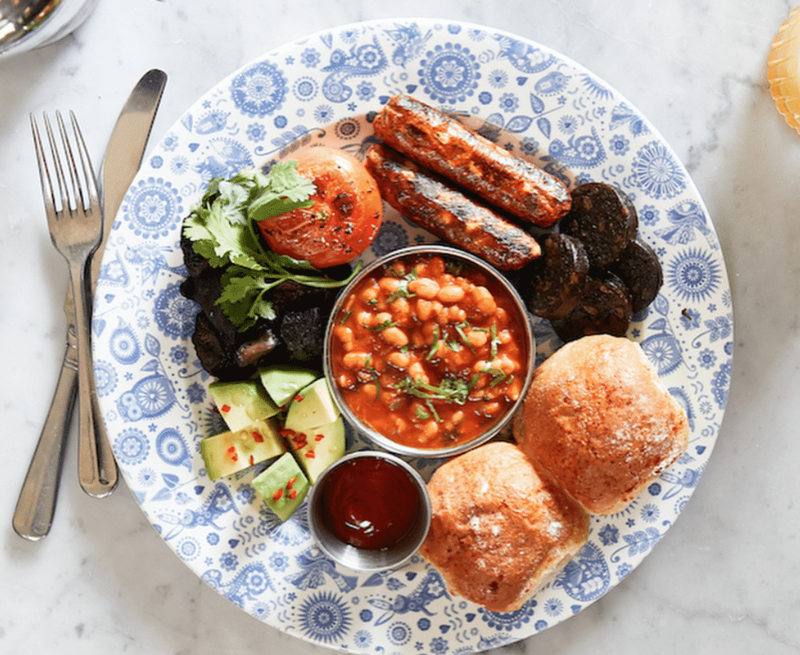 Vegan sausages, vegan black pudding, field mushrooms, masala baked beans, grilled tomato, home-made buns, and avocado with chilli and lime dressing. 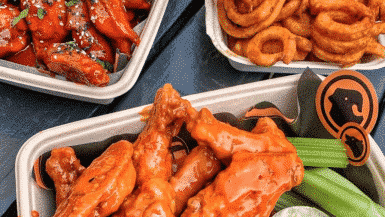 Want to knock that hangover for six straight away and get back on track? 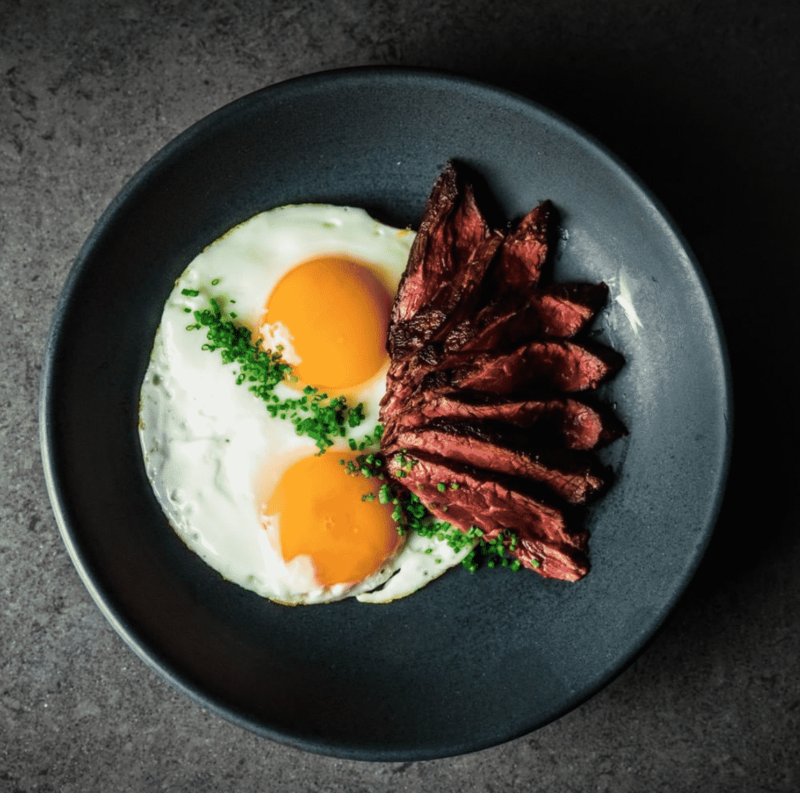 Head down for this simply perfect steak and eggs. Few fries and maybe even a sneaky little cocktail on the side and you’ll be back on track again in no time. So it isn’t technically a meal, but there are times when the best possible way to start the day is with the hair of the dog. 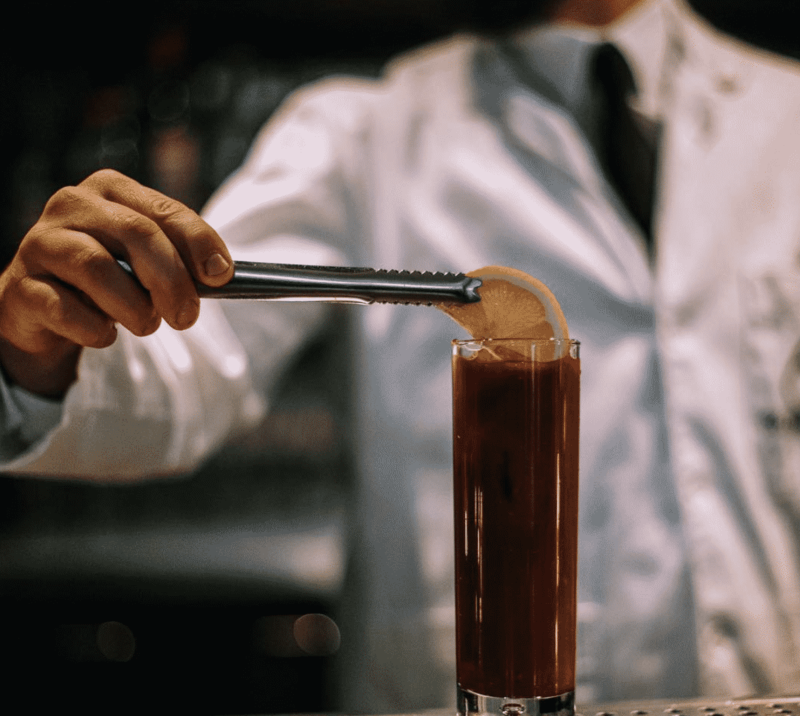 As Bloody Marys go they don’t get much better than this. You can worry about food later. An intimate townhouse with 39 rooms (although you don’t have to be staying to have breakfast) where they cook up a magnificent English breakfast with all the trimmings. Everything you could ever wish for from a breakfast. 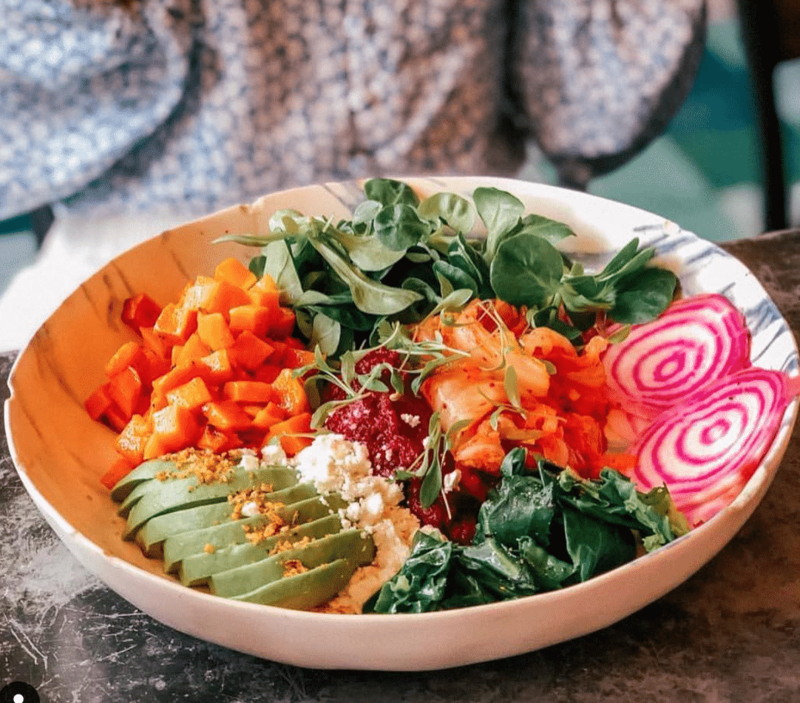 Life doesn’t really get much better than this for vegans – or indeed anybody who loves really good creative food. 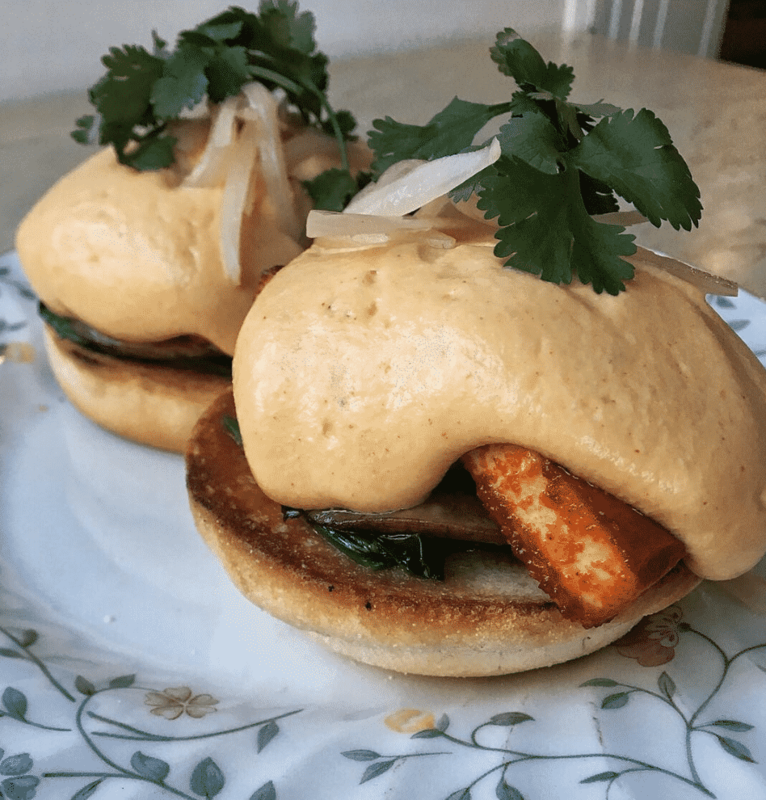 Maple smoked tofu and a whipped cashew ‘hollandaise’ sauce. A truly special room in which to make a big occasion of breakfast. 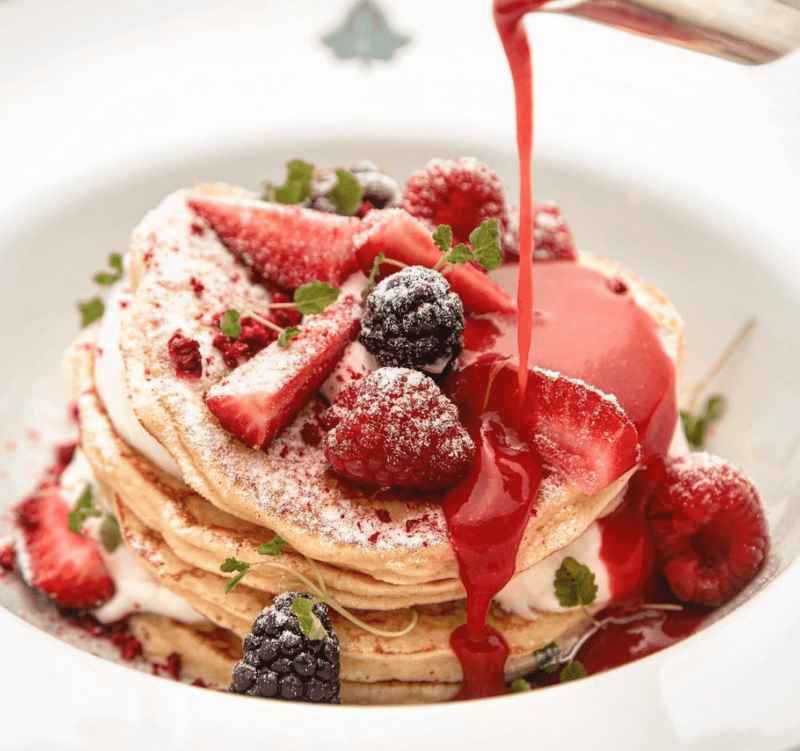 Take the day off and enjoy the start of it with one of the best pancake stacks and wonderful fresh berries that London has to offer. 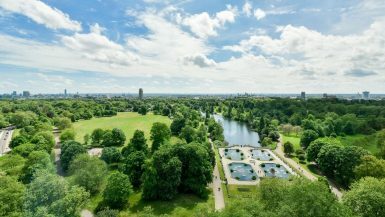 They combine the best ingredients with the most traditional methods to produce great quality food in a wonderful setting. This dish is the perfect example of what they are all about. 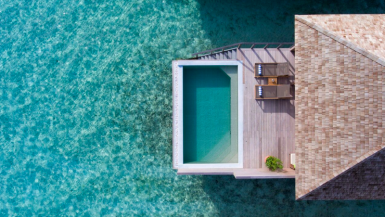 Simple yet elegant and perfect. You simply have to have breakfast in a restaurant owned by one of the best chefs of his generation. 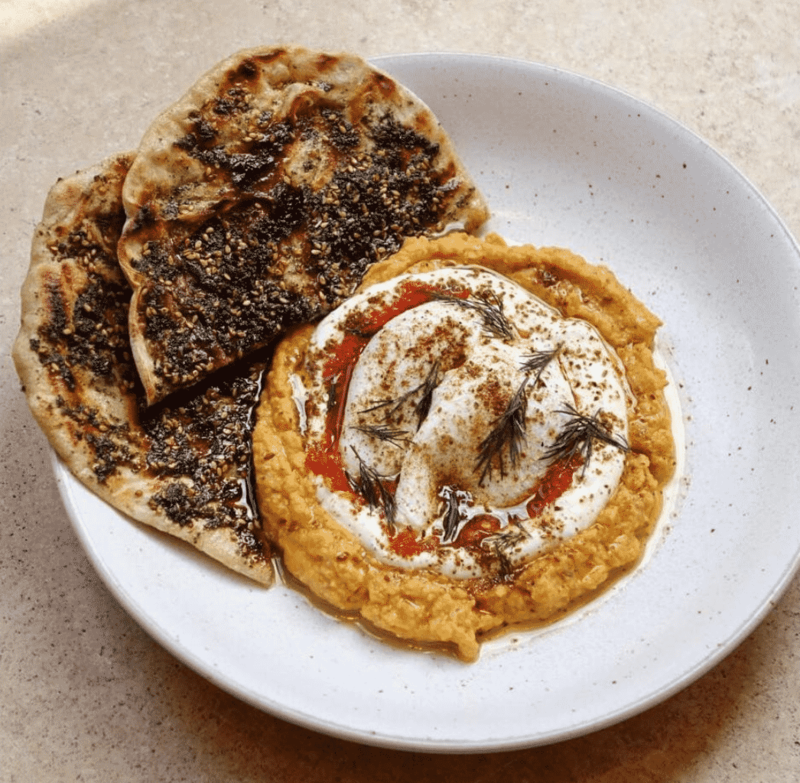 The poached eggs with butternut hummus and za’atar flatbread is an absolute flavour sensation. If you are going to be eating breakfast in a Michelin starred restaurant then you know it will be something special. 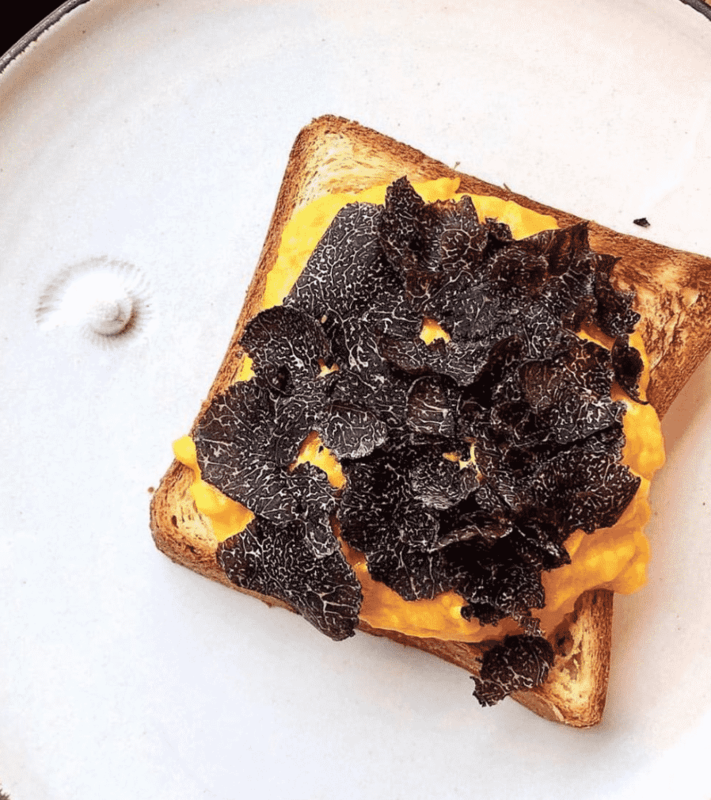 Brioche, perfectly scrambled eggs and sliced black truffle is all you’ll need to be transported to heaven. 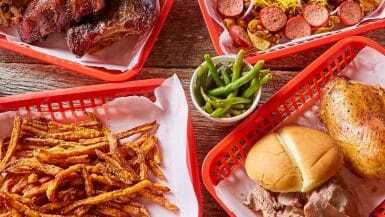 An American themed restaurant right in the heart of Covent Garden that has been going strong since 1991. This dish is so chocolaty that you’ll need to be rolled out of the place after it. Divine. 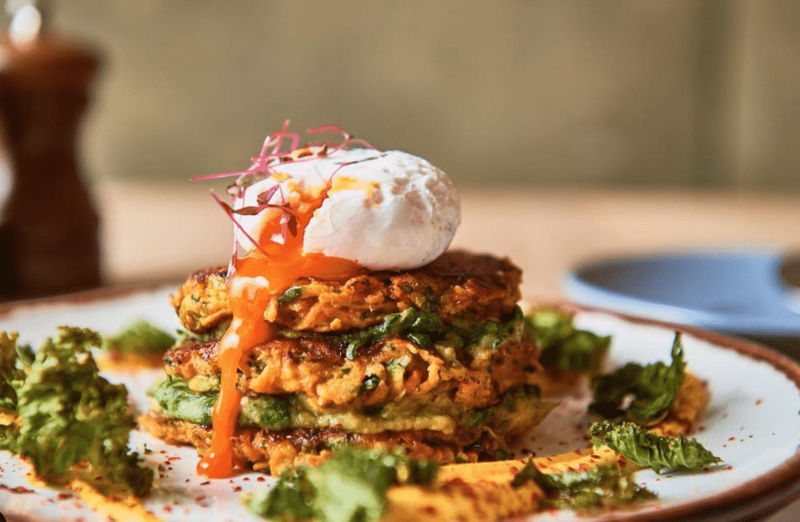 Sweet potato, courgette and feta fritters, with avocado, kale and a perfect poached egg. 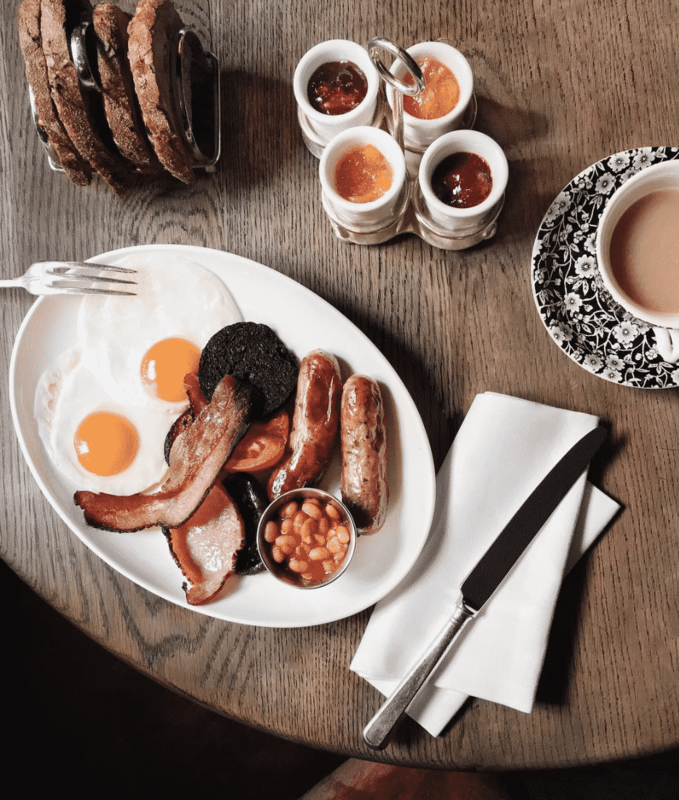 One of the very best London breakfast or brunch dishes. Inventive, colourful and delicious. Morning dishes don’t get much better than this. 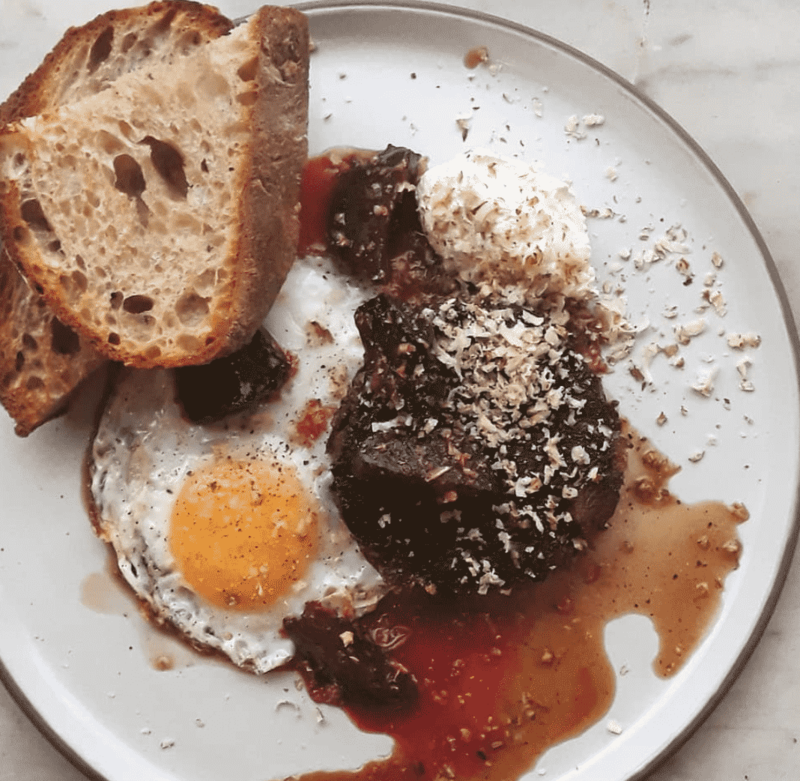 Crispy beef shin with chewy beets, cherry vin, cobnut, horseradish cream and perfectly fried egg to bring it all together. Flavour. Explosion. Available on the weekend brunch menu, these raspberry & ricotta pancakes with mixed berry & liquorice compote and Greek yoghurt will give you a reason to get out of bed on a Sunday. An insanely popular restaurant in the evening that is tough to get a table at. 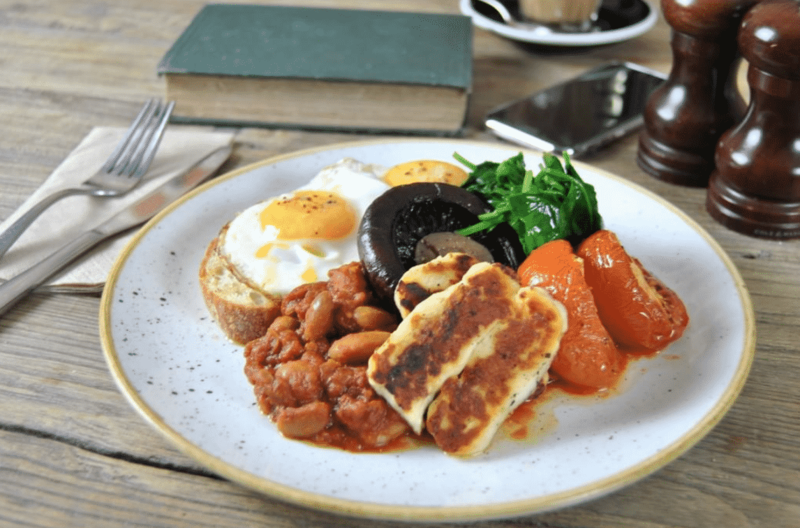 Come for breakfast though and try one of the most indulgent and ridiculously tasty dishes in the capital. Best book a gym session after this one, but worth every single bite. 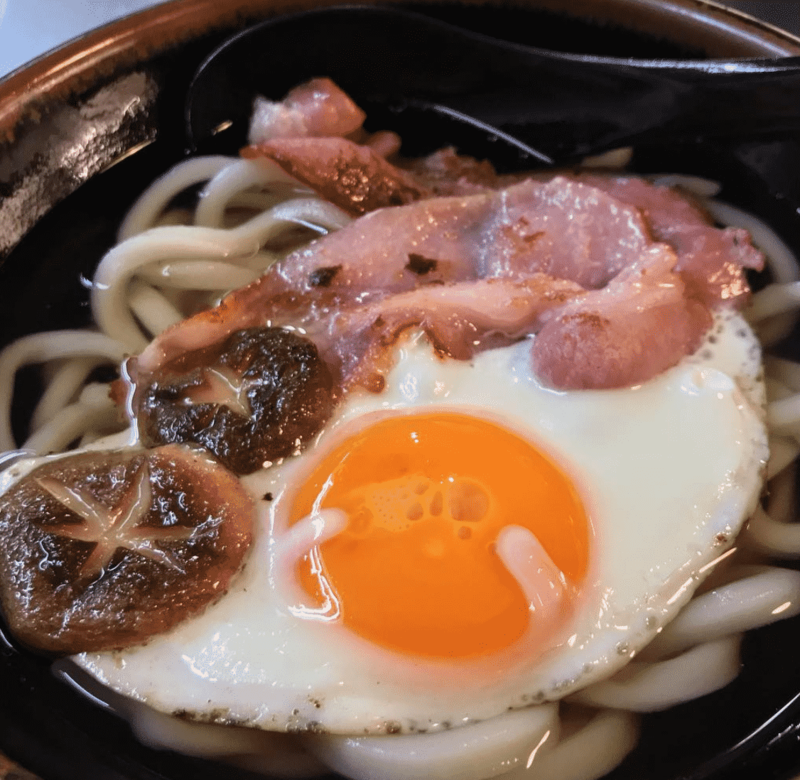 The best of English breakfast fused with a Japanese style dish. To even think this up is one thing, but to make it work and to deliver on the complexity of flavour and technicality is immensely impressive. Has to be tried to be believed. 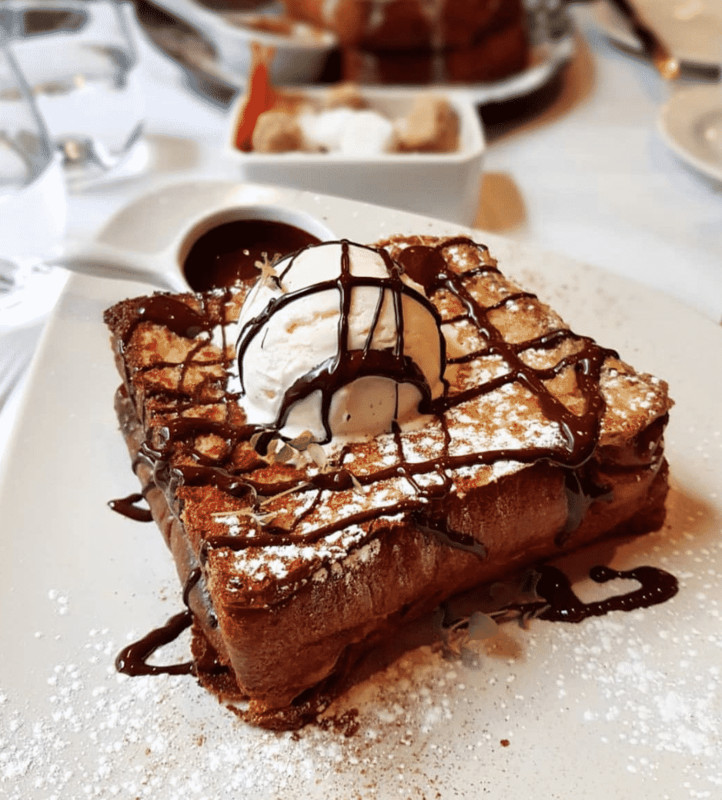 Unlike any French Toast you’re likely to try. 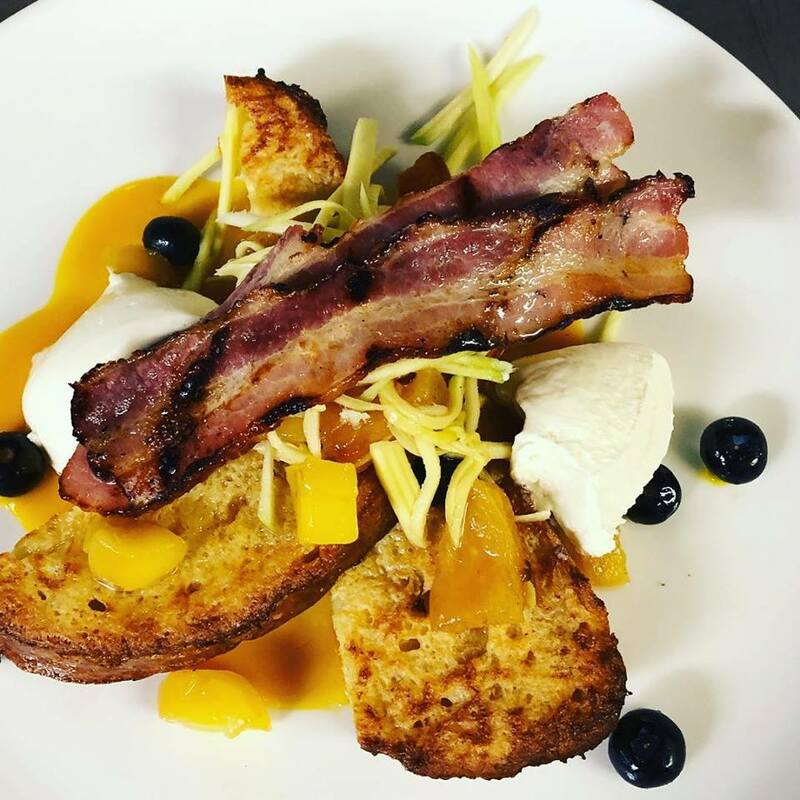 This beauty comes with roast pineapple, mango (green and regular), Oxford honey mascarpone, blueberries, verjus syrup and smoked streaky bacon deliciousness. This is about as indulgent as brunch can get. 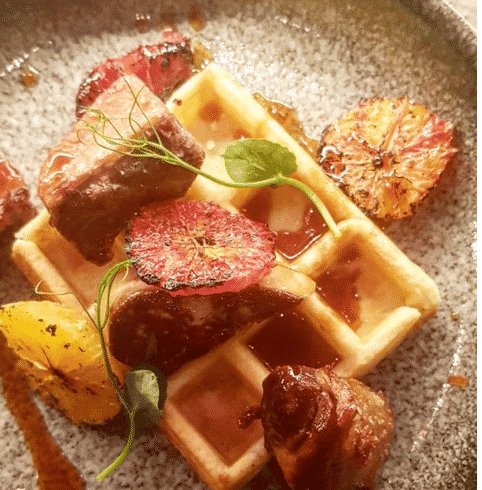 Crispy duck waffles with foie gras and caramelised blood orange. Basically, this is brunch heaven on a plate. 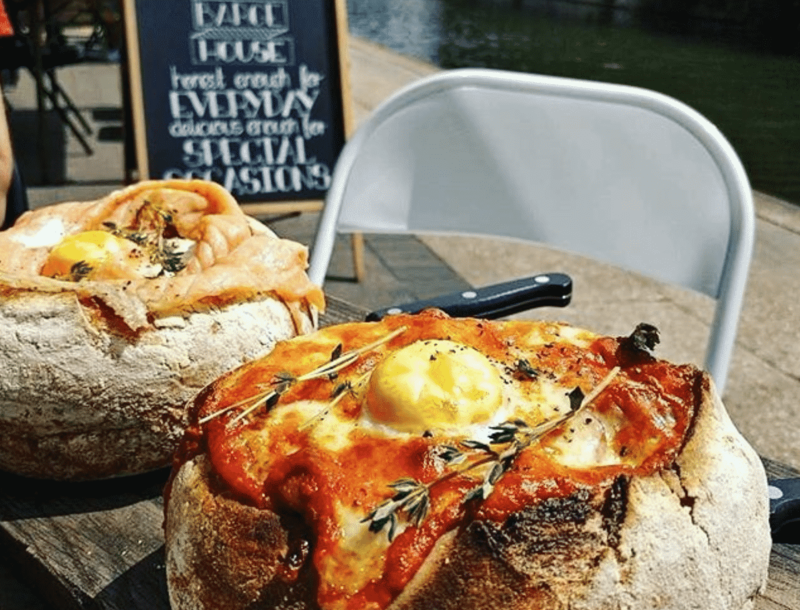 An award winning sourdough bakery and café with branches in East Dulwich & Peckham Rye. 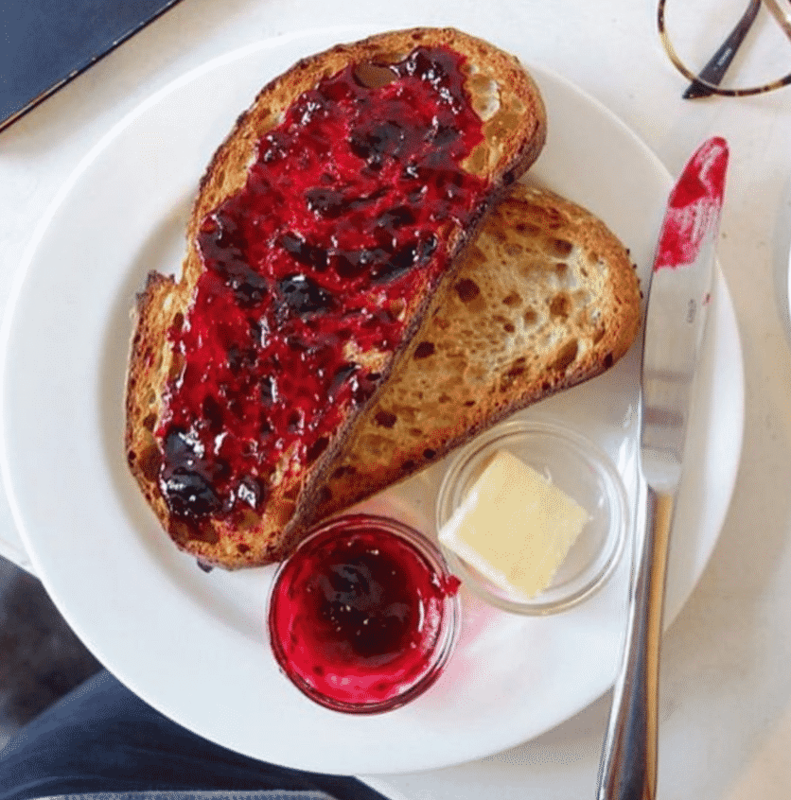 Sometimes you want something simple for breakfast and their rye toast and house blackcurrant jam hits the nail on the head. Carbs for the win. 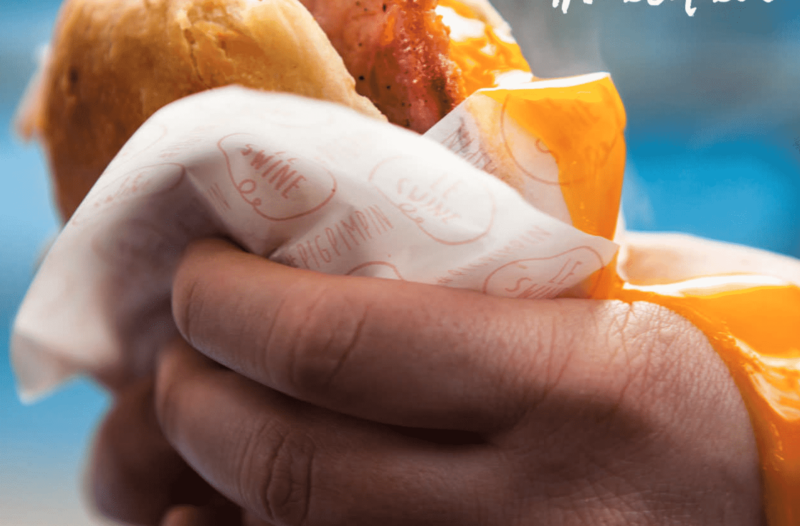 A bacon butty like no other. 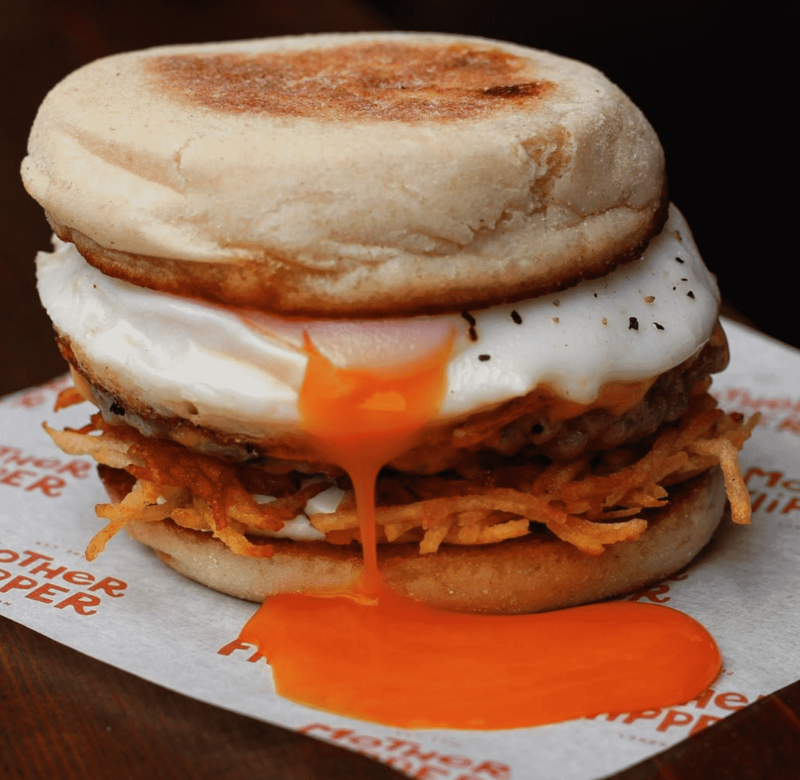 From the lightly toasted milk bun, to the bacon butter, their signature mushroom ketchup and ol’ fashioned middle bacon, this is droolworthy. Add a runny fried duck egg for extra pow. 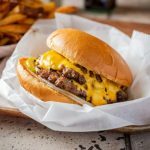 The specialise in burgers and pop up all over London so keep an eye on their social media. This delight is served up in Brockley Market every Saturday and worth traveling across the city for. 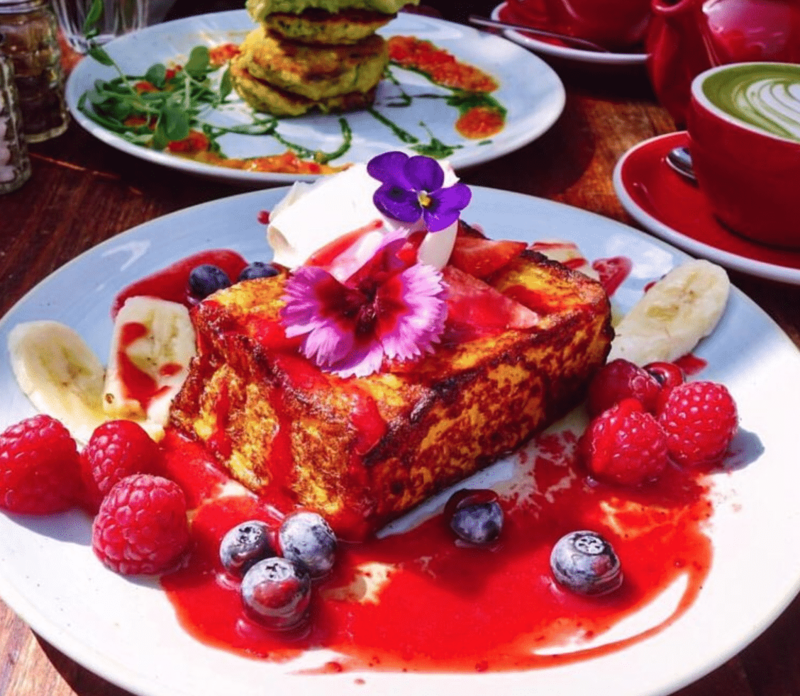 Not just tasty and healthy, but easily the most colourful breakfast in London. One of those breakfasts that you walk out feeling a million times better than when you walked in and wonderfully Instagrammable. One for the weekend brunch scene when you are after something completely different. A flavour explosion of a dish with pork belly and fried egg roti, smoked aubergine, egg & chilli roti all served with the . unique and delicious Vietnamese Style Coffee. Sometimes a simple breakfast is tastier than any loaded plate will ever be. 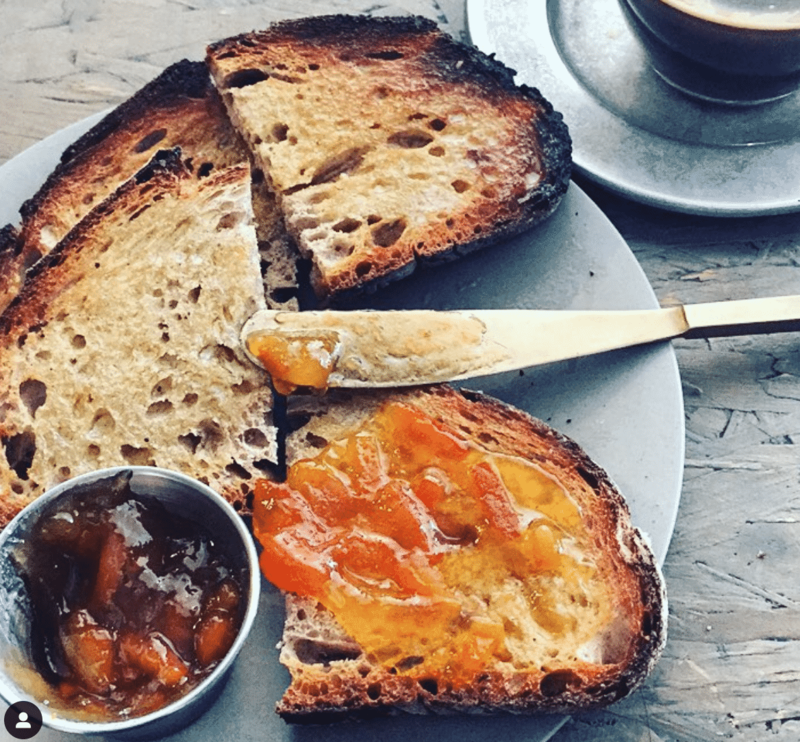 This perfect sourdough bread is toasted until golden and served with a tangy orange marmalade that will make you a lifetime fan. 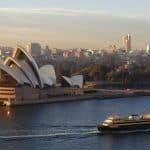 All day Australian brasserie in Kew, Putney and Richmond. Brought to you by the team behind Brew Cafe. 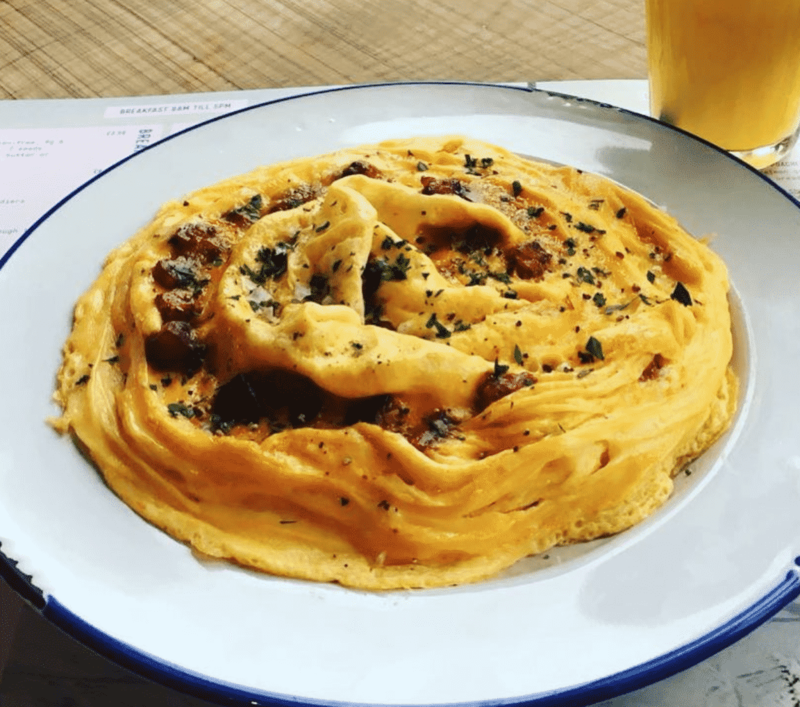 Their folded eggs with chorizo are a thing of sheer beauty and washed down with some of their heavenly coffee, the treat you thoroughly deserve. 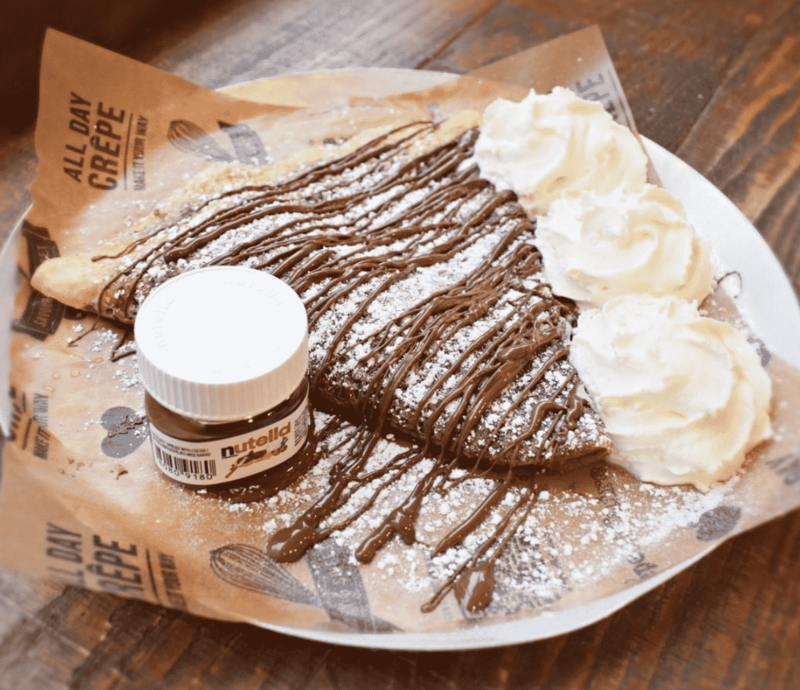 Who says that you can’t have pancakes with layers of Nutella and cream on them for breakfast? Not us anyway. The perfect way to start the day on the go followed by a bit of shopping. An ideal breakfast for those with a sweet tooth. Such a simple dish but because everything comes from their Gloucestershire Farm and is fully organic it just tastes that little bit better. The real cherry on top is the sourdough bread, which caps off a majestic dish perfectly. 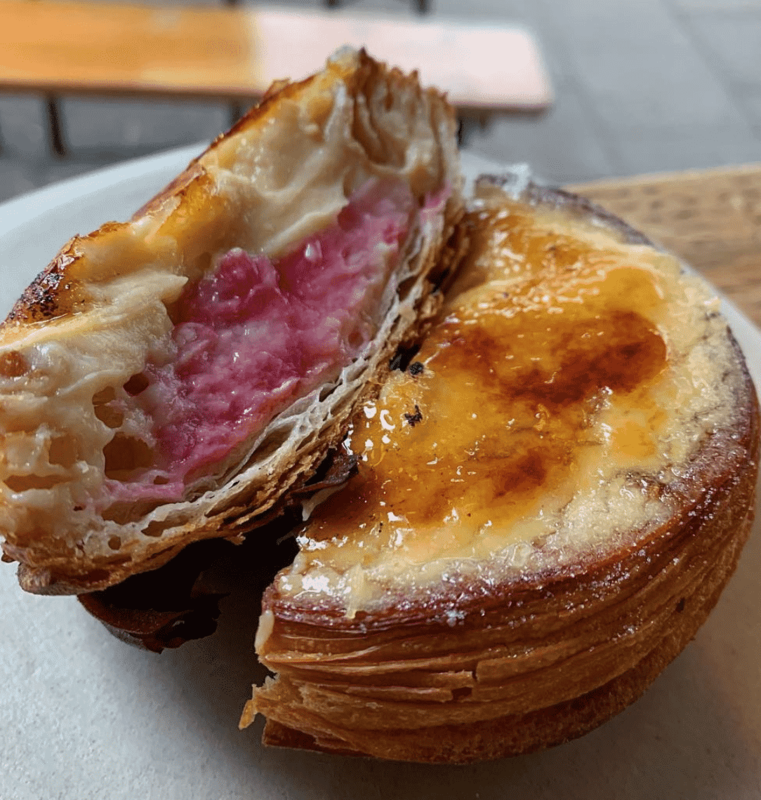 Milk is best known for their amazing coffee (and in fairness a wonderfully unique and original website) but their food is also the real deal. 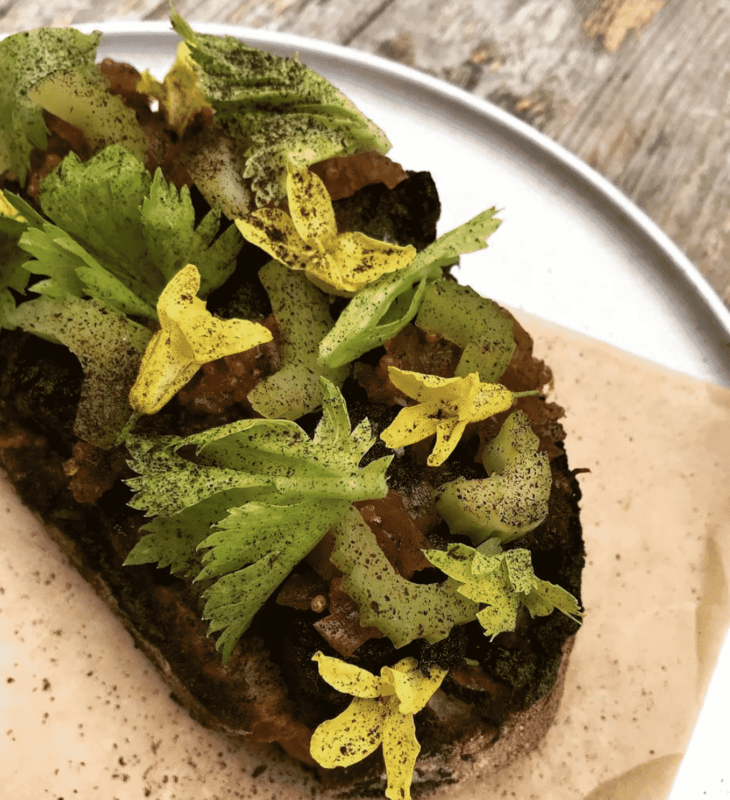 Case in point: the pan fried boudin noir on sourdough, celery chow chow, pickled celery & black walnut mustard. Incredible. 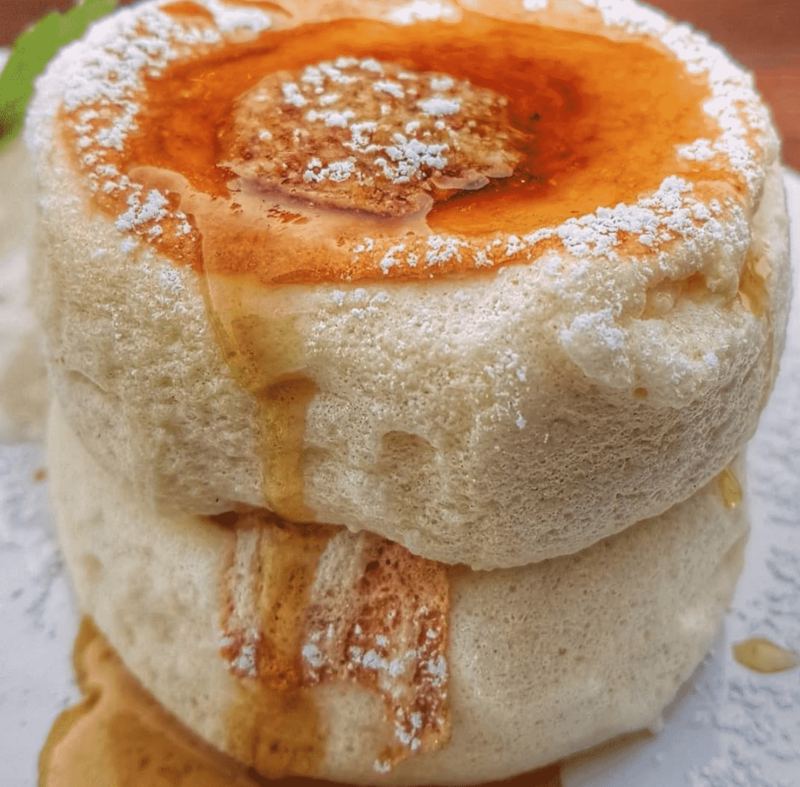 UK’s 1st Japanese Soufflé Pancake Store, these photogenic fluffy beauties are gobbled down way too easily. Have one, have two, just be sure to eat these at least once in your lifetime. Not every breakfast needs to be loaded with meat and this is the perfect example of that. 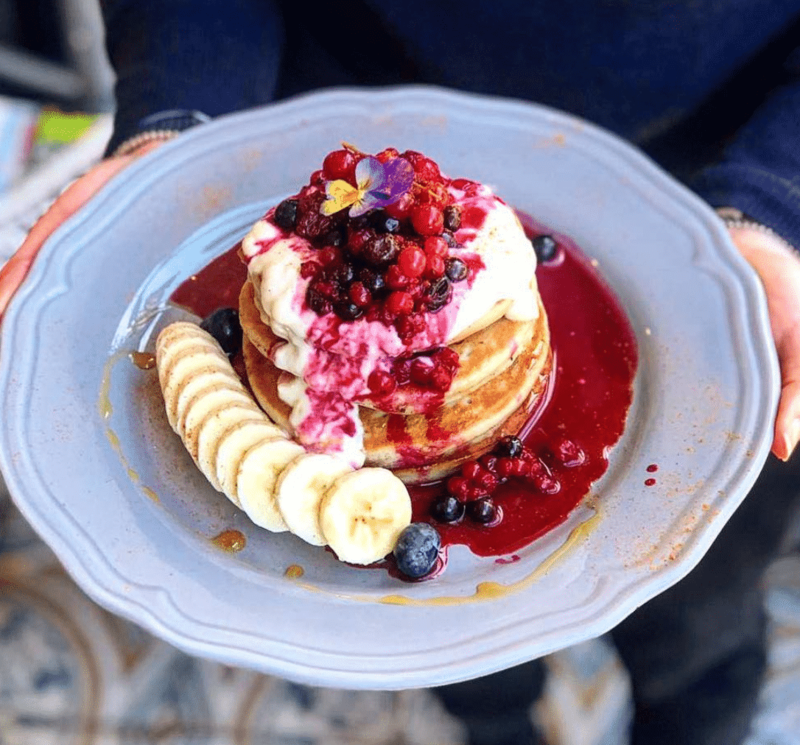 One of the prettiest and tastiest stacks of pancakes you’ll ever see and you shouldn’t feel a bit of guilt eating them. 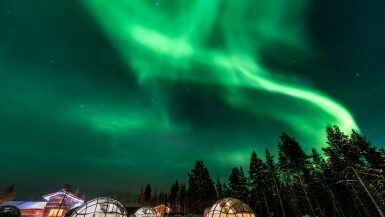 Their Danish pastries, croissants and other baked goods are to die for but this recently released masterpiece steals the show. World class baking that leaves a taste sensation in your mouth that you will simply never forget. 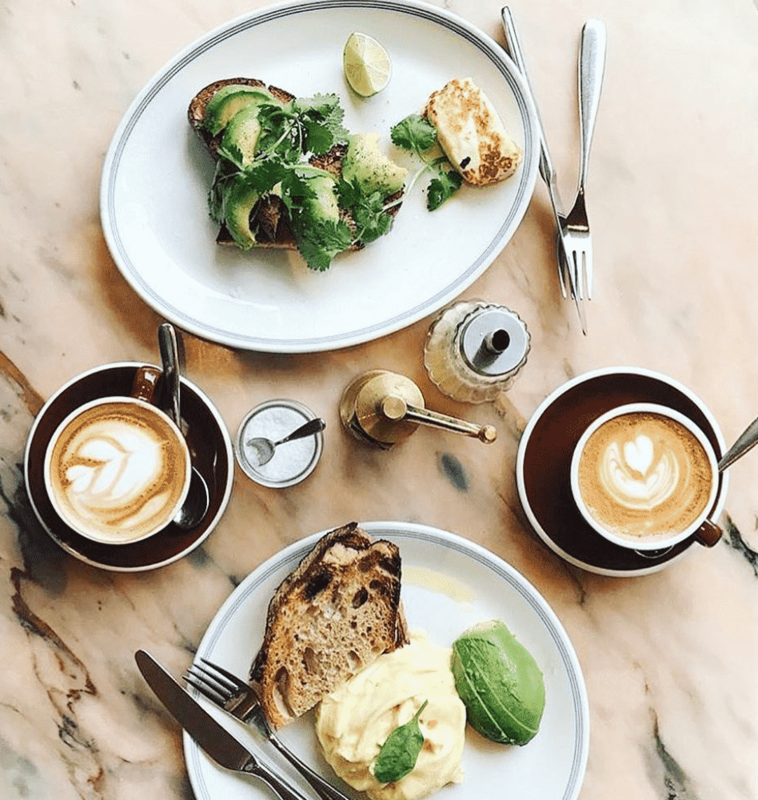 Daisy Green is an Aussie themed cafe with nine locations around the city. 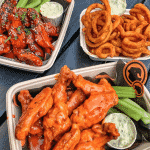 Their food is bright, vivacious, packed full of flavour and fun to eat. 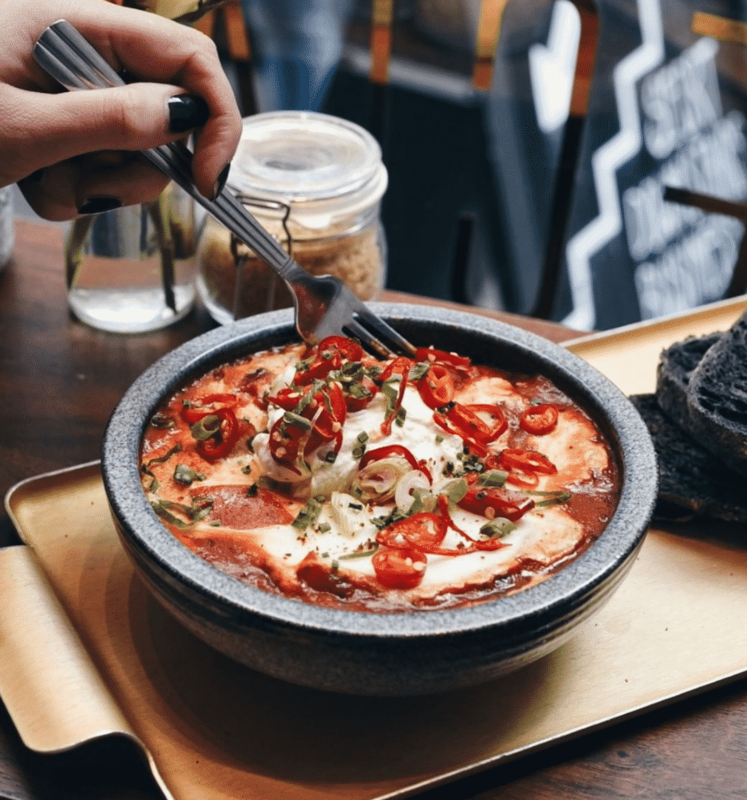 Their Shakshouka is as good as any you’ll find in the city. Dunk that bread in and enjoy every single mouthful. Trying to please a fussy group of eaters who can’t decide on one spot for weekend brunch? 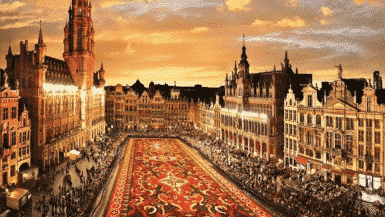 This is the place to go because with 11 great food traders there is something for everybody. A buzzing atmosphere and great cocktails only add to the mix.